Ian 40, is married with 4 children and works as a nurse manager. 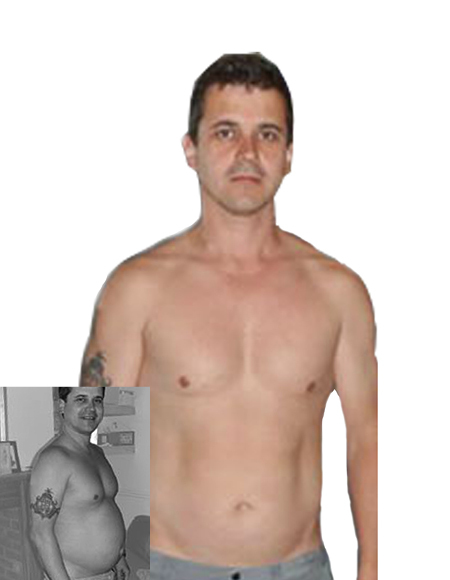 His starting weight was 15 stone210lbs95.2kg and he initially lost 4 stone56lbs25.4kg stone. He has now stabilised at a 12st 7lbs175lbs79.3kg. It was just a lucky internet search really - I wasn't particularly looking for a diet website that would make it easy to lose weight. I just wanted some kind of food diary system and Nutracheck fitted the bill. It also offered so much more, so I got really interested in monitoring my intake. How much weight have you lost in total? I lost about 4 stone56lbs25.4kg to begin with, but I started looking a bit gaunt. I went from just over 15 stone210lbs95.2kg to under 11 stone154lbs69.8kg. I could have gone further but I gave it a rest and I am now a healthy 12½ stone. My doctor has said my health checks are great now. It took about 5 months to go from 15 stone to 11 stone. I have never done a formal diet before. I used to be in the forces, so whenever I wanted to get fit I just went on a similar training regime to the ones I did in the forces and that helped to lose weight quite quickly. Running, swimming and core training exercises regularly. Plus being completely honest about what I ate. What are your top pieces of advice? Run or swim or do any kind of Cardio work to help burn the fat. How easy was it to fit the diet into your lifestyle - have you adopted a healthier lifestyle? It was fairly easy for me. I have been less disciplined with the maintenance side, but that is not such a problem if you keep exercising like I did. I have really improved my swimming a lot just by going so much. I had intended to do a triathlon but had to put it on hold due to family, work and university commitments. I still want to do one though and will go back to Nutracheck to help me. Just great, it is really nice being able to buy clothes and not worry about them hiding your beer belly, and not feeling you can't take your top off on the beach (not that you can do that much in this country).